Changing fashions ruled beer drinking in the 50s, 60s and 70s. First bottled pale ale challenged draught mild as the Nation's favourite drink. Then a few years later, everyone was drinking draught keg bitter, with Watneys Red Barrel the best known brand. There was there was a backlash against the spread of keg bitter. Lovers of traditional beers founded the Society for the Preservation of Beers from the Wood in 1963. In 1971 CAMRA, the Campaign for Real Ale, was formed. In the latter part of the seventies there was a resurgence of some traditional brews; real ale, though, still remained a minority taste. Lager was the drink of the 70s. The hot summer of 1976 provided a reason to try the beverage, but tastes were changing. Mild was the working man's drink for the first half of the twentieth century. The only choice was between mild and stout; bitter was a luxury. In 1900 best bitter was almost unknown and in 1929 it was still only a tiny fraction total beer sales. 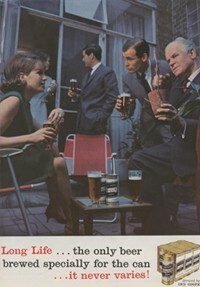 At the start of the sixties, mild was the dominant beer. Around 40% of the output of Bass Charrington, Britain's largest brewer, was mild. By 1967 this had fallen to 30%. Mild was losing favour, though it was the cheapest beer. It did have strongholds in the Midlands (notably M & B Mild), but the majority chose best bitter. Best bitter on draught and its bottled equivalent, best pale ale, were the favourite beers of the 60s. Pale ale was sold as a premium beer; it was a popular luxury. Keg bitter is pasteurised to stop any fermentation. Carbon dioxide is added to give the beer sparkle. The pressure of carbon dioxide is used to draw the beer up from the cellar. So keg beer does not need a traditional long handled beer pump. The first keg beer was Watneys Red Barrel, developed in the 30s. The big brewers though, did not heavily promote keg bitter until the late 50s. The first brewer to use the term keg and to promote sales of keg beer was Flowers (later taken over by Whitbread). Many of the others followed suit and each launched their own brand of keg bitter: Worthington 'E', Whitbread Tankard, Ind Coope Double Diamond, Youngers Tartan and Courage Tavern. Sales of keg beer increased steadily throughout the sixties. In 1960 it was 1% of the total beer market, by 1965 7% and by 1971 18%. Keg beer was most popular with the young. 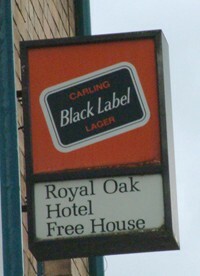 It was the natural choice for the new themed pubs and disco pubs of the 60s. Keg bitter was more expensive than traditional cask conditioned ales and was marketed as a premium brand. There was a tendency for brewers to reduce the strength and original gravity (a measure of the proportion of ingredients, hops, barley etc to water) of cask beers. The keg beers were the best the brewery had to offer so there was no need to spend as much on the cask conditioned beers. Throughout the sixties people suspected that that beer was getting weaker; they were right. By the latter part of the sixties, carbon dioxide was often added to cask beers as well; they were drawn up from the cellar under pressure in much the same way as keg beer. For the drinker at the bar, there was little to choose between them. The more discerning opted for keg. The rise of keg bitter in the sixties stopped a trend that had begun after the War of increasing sales of bottled beer. It even appeared that sales of bottled beer might overtake draught beer. Reasons for choosing it over traditional ales were consistency, brightness, a clean palette and sparkle. Keg bitter provided all these qualities at a cheaper price. Canned beer was in its infancy in the late 50s. Ind Coopes Long Life was one of the first. The brewer picked up on concerns about the quality of cask ales and claimed Long Life was brewed for the can and never varied. Canned beer sales increased throughout the sixties, but did not become important until the seventies. Watneys Party Seven was a new take on canned beer. Before the 60s, the supply of beer had been regional. There were a few exceptions with bottled Guinness, Bass and Worthington sold throughout the country. In the sixties other national names emerged, namely Double Diamond (bottled), Mackeson Stout (bottled) and draught and bottled Watneys Red Barrel. Watneys Red Barrel was making inroads into the free trade. Double Diamond, Bass Worthington and most notably Guinness, were becoming increasingly available as draught. The success of Guinness encouraged Watneys to compete with Colonel Murphy's Stout. After a test marketing campaign, they abandoned it and stocked draught Guinness in Watneys' houses instead. By the end of the sixties, lager too was more popular. Draught Carlsberg was available at Watneys' pubs and Whitbread had linked up with Heineken. Sales of lager, though, did not become significant until the 70s. Strong ales were often sold in nip bottles (one third of a pint). The most famous was Tennant's Gold Label; it was in the Guinness Book of Records as the strongest beer on regular sale in the UK. Later it was brewed as Whitbread Gold Label. 70s advertisements told drinkers that it was "Strong as a double Scotch, less than half the price". It is still available today. At the beginning of the 70s, the most popular brands of keg bitter dominated British beer drinking. They were more expensive than cask bitters, so people must have liked the taste or bought the advertising. Advertising of keg bitters made extravagant claims. Whitbread Tankard was supposed to help you excel, how, was not made clear. Beer had long been advertised as a drink to improve heath. The "Guinness is Good for You" and "Guinness for Strength" campaigns are famous. Was a touch of parody intended? Rivals made equally bold claims. Worthington 'E' was "the taste that satisfies". Courage Tavern was "What your right arm's for". Double Diamond "worked wonders". Keg bitter's popularity was challenged in the 70s by lager. Sales of lager increased from only 2% of the market in 1965 to 20% in 1975. Lager had been sold in Britain long before the 60s. It was brewed here as early as the 1890s, but was a very small part of the beer market. It had a reputation as a ladies' drink. When mixed with lime it was considered as an alternative shandy. Today's well known brands of lager were introduced in Britain from the 50s. The brewery magnate E P Taylor brought Carling Black Label to Britain, from Canada, in 1953. Starting from small beginnings, brewed under licence by the tiny Hope and Anchor Brewery, a series of mergers left Carling Black Label part of the Bass Charrington empire. The other big brewers introduced their own brands. Guinness launched Harp Irish Lager in 1960. Whitbread signed an agreement to import Heineken in 1961; Watneys linked up with Carlsberg in 1968. Whitbread brewed Heineken under licence in the UK in 1968. The Whitbread directors thought a weaker version of the Dutch beer would sell better - they were right. Later the Belgian beer, Stella Artois, joined the Whitbread stable as their premium lager. It was the long hot summer of 1976 that firmly established Britain's taste for lager. Cool and refreshing, it was the beer to beat the drought. By the end of the decade, lager took 29% of beer sales. There are many reasons for the rise in the popularity of lager. Package holidays in Europe gave people a chance to try lager and they associated it with relaxation and warmer climates. It goes better with more exotic food. Continental dishes - French and Italian - were popular in the 70s, as were Chinese and Indian food and there is no better accompaniment to a curry than a pint of lager. Beer lovers fought back against the aggressive promotion of keg bitters. Traditionalists founded the Society for the Preservation of Beers from the Wood (SPBW) in 1963. Members wore black ties with pictures of wooden barrels. They were mourning the death of traditional beer. The society's rules forebade members to drink keg if traditional ale was available within half a mile's walk, or five mile's drive. CAMRA, the Campaign for Real Ale, was founded in 1971. In the 1970s, sales of cask beers began to rise as there was a growing appreciation for the traditional methods of brewing. It is a testament to the success of CAMRA that the "classic" keg bitters of the sixties are now extinct. 'Pub' edited by Angus McGill, published Longmans 1969, page 32. "I've been out of the country for 20 yrs. On returning the first thing I wanted was a pint of Forest Brown. What the hell happened? I can't stomach lager's and will always stick to a good British Ale - what's left of them. Over seas you really have to hunt for a true brewery.
" Hi all, Was there Landlord Bitter about in the 70s? Would love to know. Bit of a funny question like. "I know you can still get Newcastle Brown but can you still get Forrest or Watneys Brown ale. "I remember Colt 45 as well, I also remember my local at that time (since demolished)having a 'promotion' night where we were encouraged to drink a yard of the fizzy awfullness. Consequentially the loos were pretty disgusting that night. "I'm too young to remember the taste of most of the keg beers, but remember a lot of the early 80s adverts - Whitbread best "The Best Best needs no etiquette" and Courage best with Chas n Dave playing the music. "WHAT THE FLAMING HECK HAVE THEY DONE TO WORTHINGTON WHITE SHIELD??? The stuff they're selling bears NO RESEMBLANCE to the original. Ye Gods, you can even SEE THROUGH IT! And what idiot decided to ditch that marvellous Victorian label in favour of this effort - it looks more like an English Defence League banner than a beer label. "They remade a cask version of Worthington E at the GBBF not so long ago, and apparently Double Diamond is still brewed for the Duke of Edinburgh. "I'm looking for the WATNEYS RED Barrel Dispenser complete with Drip Tray, to replace the one that was removed from the renovated HMS Cavalier (A WWII Destroyer ) in The Historic Dockyard. Chatham. "Good old days of Watney's. I thought it was disgusting, but drank the stuff anyway because that was what everyone else was having. You couldn't get away from Party 7's in the early eighties! "I was involved in buying for a wholesalers in the 1970's and remember many of the brews mentioned. Along with Colt 45 was an American brew called Hemeling whose advertising was surfing based. I also bought regional beers such as Badger beer and Brock lager in cans. A popular joke at the time was, "do you have any Colt 45?" "I was in the Hyde Park Microbrewery( was the Hyde Park Hotel ) in Plymouth, Devon on Wednesday 16/04/14, and they had Watneys Red Barrel and Ind Coope Double Diamond, keg on sell at Â£2.50 pt. I asked the bar staff who brewed it and they did not Know or not say. "As an Aussie in London in the 70's stayed away from the lager and light n bitter was the drink. Watneys Red thats the best fing yuv said..
"Beer marketing is mostly about the appearance of the can rather than the quality of the contents. Modern light beers are made to have a shelf life of several years. This even includes selecting the right barley to have the lowest protein modifying enzymes. "I am visiting the UK in a couple of weeks and intend trying to get a pint of Brown and Mild, although I don't fancy my chances. Love the site. Thanks for some happy and "mildly" unhappy memories from my early drinking days in the 60s and 70s. Now a confirmed real ale consumer but what happened to the days when you could ask for a light and bitter and get a pint plus ++++. Ah happy days. Watney: Red Barrel, replaced by Red (which was a failure). Brewed in Putney. Ind Coope: Double Diamond. Brewed in Romford. S&N. Tartan. Brewed in Edinburgh. Courage. Tavern. Brewed at south end of Tower Bridge. Youngs. Youngs Ram Keg Bitter (Yes! It existed. It had a sheep in a perspex cube as a bar fitting.) Brewed in Wandworth. The best beers in London were in bottle. All the above brewers had a full range, the fullest and best being Watneys: Pale Ale, Strong Pale Ale, Brown Ale, Strong Brown Ale, Dark Barley Wine, Pale Barley Wine, Milk Stout. Favourites: Watney Stingo Dark Barley Wine, Whitbread Poacher Brown (strong), Worthington White Shield (Bass), Courage Imperial Russian Stout. The first big brand lager in London was by Guinness, called Harp. "Carlsberg released V-Beer, the original name of Special, when Churchill visited Copenhagen in 1950. A case was given to him, and the brewery then sent him cases of Special brew from then on as it was his favorite beer. "Does anyone remember there being keg Bass in the late 60s/early 70s? I worked at the Thistleberry Hotel in Newcastle-under-Lyme and am sure that they sold keg Bass and draught Worthington E.
I've been boozing in and around Sunderland for well over thirty years. Although I never used to mind lager (and can even remember a period during the early eighties when the landlord of the Royal Marine in Sea Road, Fulwell, which was then a Tetley's pub, kept an especially nice pint of Skol), I've always preferred ale. I'm fortunate not to mind how it is brewed, cellared, or dispensed, and regardless of whether it is cask, keg, bottled, or canned, I could name you excellent ales, terrible ones, and all points in between. In my experience, however, most ales tend not to translate well from one form to another. For example, Vaux Double Maxim (a far superior bottled brown ale to a certain higher-profile rival I COULD mention, and still brewed today by a company that ex-Vaux employees, some of whom are known to me, founded) is fine in bottles and cans, but the cask version is comparatively poor. Keg ale was to the fore at the start of my drinking 'career', and particular favourites of mine were Vaux Samson, McEwan's Best Scotch, Newcastle Exhibition (occasionally), Federation Special, Whitbread Trophy, and Bass Stones. Cask Bass ale was very rare in those days, but nice when you could get it, and after the eventual cask ale renaissance, good old stalwarts like Theakston's Old Peculier, Greene King Abbot Ale (the stronger Abbot Reserve is also very nice), Ruddle's County, and Flowers' Original became part of my staple diet! Sadly, with the exception of Stones, all of the keg ales I have mentioned are no more, and have largely been replaced by John Smith's and/or Boddington's bitter, both of which I detest (I used to enjoy SAMUEL Smith's 'Old Brewery' bitter and bottled brown ale, but there was only one Samuel Smith's pub that I knew of in this area, and I'm pretty sure it no longer exists bloody typical). An earlier poster mention that the Rosedene pub in Sunderland still sells Trophy and, in fact, that is where I enjoyed my last pint of a that wonderful brew. Sadly, I am writing this two days after a friend of mine, a regular in the Rosedene, informed me that the Trophy has been taken out and replaced by... you've guessed it... John Smith's! Bloody sacrilege! As for cask ale, I think it has been a victim of its own success, in that too many micro-breweries are jumping on the bandwagon to produce what amounts to glorified home-brew... and we all know how rank THAT can be! Most pubs seem to be going for a 'scatter-gun' approach regarding the choice on offer, too, resulting in a bewildering selection of Mickey Mouse ales you've never heard of and on the rare occasion that you DO find one you like, chances are that it will have been replaced by something else the next time you visit that particular pub! I don't think I'd call it a 'success' of CAMRA at all that most classic keg ales are now extinct! Indeed, it's almost certainly thanks to that 'success' that the same can be said for many classic CASK ales, too! "Just a few further thoughts following on from my previous missive yes, unbelievable as it may seem, there IS more! Just been doing a belated bit of mental arithmetic, and realised that I've actually been boozing in and around Sunderland for over FORTY years! How quickly the time flies! Of the new(er) breed of more mainstream cask ales, Sharp's Doom Bar has become a favourite of mine. The Forth in Newcastle keeps an especially nice pint. "I started putting it away around 35 years ago and my memory of those mass produced keg bitters is not good. The thought of a pint of Greenhalls or Whitbread makes me wince. Awful tasteless stuff from brewery's pandering to fizzy lager drinkers. Luckily I lived in a place where Holts, Hydes, Robinson and Boddingtons served up proper beer (the fella moaning about Boddingtons should know the Boddingtons brewery is now a car park, the name is basterdised) so I always had an alternative. "I didn't realise how popular lager was back in the 1970s. With different microbreweries, real ale options, real cider and craft beer, it seems as if the U.K. really was living in the dark ages. "I spent two years in UK from Jan 1960 & worked in two brewery stores for a period of time. Brewery no1 was Youngs Wandsworth & the second was ??????? ( the Reading Brewery) who used to send beer to a Wandsworth Rd stores & I used to accompany the delivery trucks to do the unloading. "The last time I saw, and then drank, bottled Double Diamond was in the off licence in Lycksele. Lycksele is about 150.miles south of the Attic Circle in Swedish Lapland. Also on offer were bottles of Shepherd Neame Bishop's Finger, Riddles County and, strangely,Newcastle Brown in half pint bottles. The DD was as awful as I remembeted it being. I am no lover of keg beer, an immitation of the real stuff. In Hastings you can still get a light and bitter, although the young bar staff aren't very clued up on it. In some pubs you'll even get a black and tan. When I ran a Shepherd Means pud they did a great handpump double stout. It got s bit laggy after one or two pints, but mixed half and half with bitter it eent down a treat.